28x 146 GB hardrives (Seagate Cheetah ST3146807FC and Hitachi Ultrastar HUS103014FLF210)…I am waiting for my now.netapp.com login to be activated at the moment – so I could not do any tests. NetApp decided to not deliver any CD or manual inside the two packages…weird. The hardware itself looks very very promising (got the joke? )… it’s all redundant and quite heavy. You can clearly see that it’s far more pricy than the cheap promise/easyraid hardware. on top the FS270 and below it the DS14MK2. 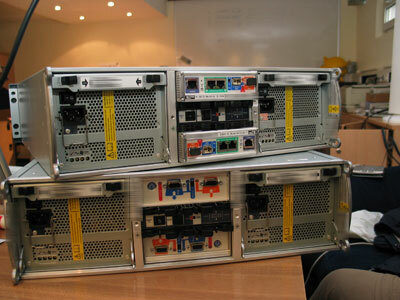 All equiped with 10k UPM SCSI drives. Hope you check a NetApp system again in future!